The Total War series began in Feudal Japan, passed through Medieval Europe, and has now arrived in Ancient Rome. The gameplay has always been solid, but with every iteration the series has improved upon itself and in Rome: Total War (RTW) it is firing on all cylinders. 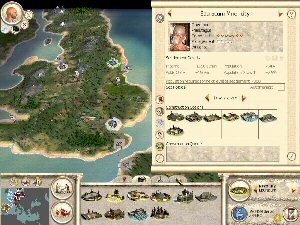 If you’re a strategy gamer you’ll love the game’s blend of strategic empire building and real-time tactical battles featuring thousands of troops. There’s a lot of depth to this game and you’ll enjoy spending hours exploring it all. RTW puts you at the head of one of Rome’s most powerful families at the time when the Roman Senate was all-powerful and the Caesars had yet to take power. Your overriding goal is to become a Caesar yourself by marching into Rome over the dead bodies of your rival faction’s armies and to help Rome achieve her destiny as ruler of the Ancient world. Your path to glory begins on the game’s strategic map which provides an overview of the Ancient World. In prior Total War games this map resembled a game board, but in RTW it is a gorgeous 3D relief map filled with terrain and landscape features, rivers, and cities. You can even see caravans traveling along trade routes. And it is more than just for show – mountain ranges can hide approaching armies and armies can lie in wait in forests to waylay passing enemies. The strategic map also has an effect on the tactical map when armies clash. Cross a river from the west to attack an army in woodland terrain and the tactical map will contain woodland terrain and you’ll begin on the west side of the map with a river between you and the enemy. Managing a city in Britain. The strategic map is far more than a place to maneuver armies – RTW’s strategic component is as deep as those in most turn-based empire building games. You must manage the guns and butter equation as you decide whether to build up your cities to grow your treasury or to concentrate on military structures and expanding your army. You can set the tax rate for each city that you control, build public buildings to keep your citizens happy (or a large town watch to keep them in line), and create road networks to speed your troop movements and expand your trade. There is also a diplomatic component to the strategic game in which you can negotiate military alliances and trade agreements as well as spy on and subvert your neighbors. Your faction in RTW is a powerful family, and one of you greatest asset are the members of that family. Your family’s patriarch serves as both general and governor. On the field of battle, his leadership skills keep troop morale high and bolster their fighting skills. When in a city, he allows you to specify the build order of troops and buildings, something that is otherwise out of your hands. In addition, he also can inspire loyalty in the population, reducing the likelihood of turmoil and providing a power base in your push for Rome. As the game progresses, births in your faction’s family will provide you with new leaders as older ones age and die. Each leader will progress through a career as a Roman leader, gaining skill and renown with each victory on the battlefield and appointment to a Senatorial position. He will also gain a retinue of philosophers, administrators, and more whose presence will provide him with bonuses in various areas of leadership. The leaders are individuals, each with their own unique portrait, strengths, and weaknesses, so part of the strategy in the game is playing your leaders for their strengths. This is really a pretty interesting feature of the game, and you’ll find yourself growing attached to certain individuals as you watch their careers unfold.